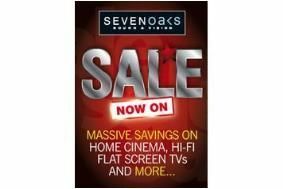 HOT DEALS: Sevenoaks Sound & Vision sale starts early! | What Hi-Fi? HOT DEALS: Sevenoaks Sound & Vision sale starts early! Looking for a Blu-ray recorder? Then don't miss out on the Panasonic DMR-BS850 at £749. If it's a TV you're after, you can purchase the Philips 42PFL9664 LCD TV – our 2009 Product of the Year – for £1499 with a two year warranty and claim a free Blu-ray player up to £150. Alternatively, the Samsung PS50B850 plasma TV can be bought for only £1099 with a one-year warranty. Purchase a Panasonic TX-L32V10 for £779 or a Panasonic TX-L37V10 for £959 and you'll get a free Panasonic DMP-BD60 Blu-ray player too. Home cinema fans have plenty more to tempt them. The Award-winning Denon AVR-1910 can be bought for £429, and the Yamaha YSP-40D soundbar for £799. Sevenoaks is also offering the Arcam AVR600 AV Receiver for £3499 with HMV vouchers worth £250. There are some great deals for hi-fi enthusiasts too. How about the Award-winning Cyrus CD 6 SE CD player for £699 or the Cyrus CD 8 SE for £999? And the Marantz CD6003/PM6003/Wharfedale Diamond 10.1 combo is all your for £599. Check out the Sevenoaks website for these deals and plenty more. Items may be purchased online or in store. To get advanced information on all Sevenoaks Offers, sign-up for the Sevenoaks e-newsletter.